Comedian surprises Murray Hill adoptive mom with college tuition check for $100,000 - The Resident Community News Group, Inc. | The Resident Community News Group, Inc.
Jessica Hamm with her daughter Delilah and fiancée Jennifer Paez, holding Caroline. Comedian Jimmy Fallon and Barbie™, a brand of the Mattel Corporation, gave a Murray Hill mother a jaw-dropping surprise when she attended his show in New York City Dec. 18, 2018. 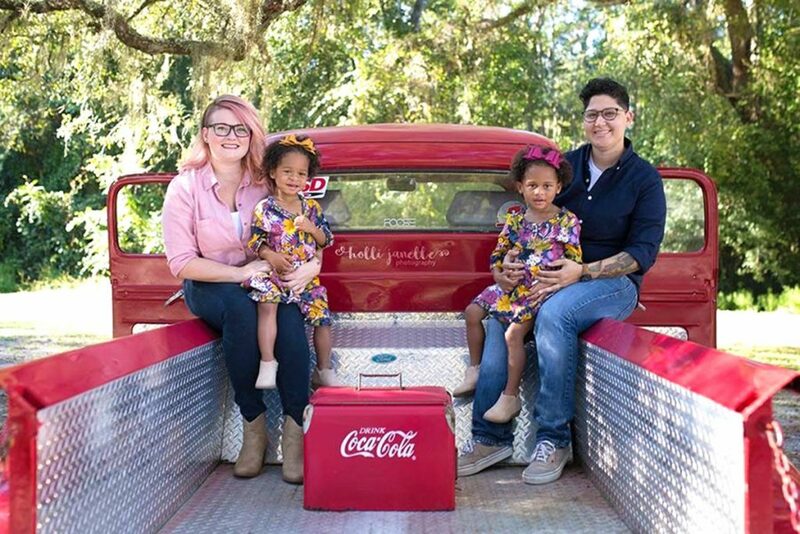 Jessica Hamm, a 31-year-old pediatric intensive care nurse at Wolfson Children’s Hospital had made international headlines in 2017 when she decided to adopt twins – both abused, with one so severely hurt she needed to spend a month at Wolfson. Producers of The Tonight Show with Jimmy Fallon learned of the adoption through extensive national media coverage at the time of the adoption. With the help of Wolfson Marketing Manager Vikki Mioduszewski, Fallon’s team developed an elaborate ruse to lure the unsuspecting Hamm and her daughters, Delilah and Caroline, to New York so they could award her with a check for $100,000 to support her girls’ college dreams. “The producers really wanted to make Jimmy’s story impactful. Last year they gave $50,000 to a homeless Girl Scout troop. The producer told me she had never gotten $100,000 from a sponsor,” said Mioduszewski. “I couldn’t tell anyone.” Because Hamm is a working nurse, Mioduszewski cleared it with the producers that she would mention it only to Hamm’s boss, who would be sworn to secrecy. The Tonight Show flew Mioduszewski, Hamm and the two girls to New York in mid-December. “We had to come up with a story about why she was going to The Tonight Show, so the reason we told her was cute,” recalled Mioduszewski. “I told her she was going to be in a People Magazine photo spread with other people who had been featured in its ‘Heroes Among Us’ column. Jess knew People Magazine as my favorite magazine of all time,” she said noting that Hamm had been featured in a full-page Heroes Among Us Spread in its May 14, 2018 issue, a “big deal” for the children’s hospital. However, the story was just a fib and People Magazine had nothing to do with her recent cash award, she said. “I figured if I told her that, Jess would probably not question why the Wolfson PR person was going with her in this situation,” said Mioduszewski. “I am still in shock about the entire experience!” said Hamm. “It amazes me how many people our story has reached and touched. To me it’s just everyday life of how we became a family. When I realized what was happening on the show, I was speechless. It was a humbling moment that went so quickly I can’t even be sure what I said at the time. Hamm’s first encounter with her daughters came in March 2017 when the little girl she would later rename Delilah was only a 14-month-old baby. Delilah had been rushed to Wolfson Children’s Hospital’s pediatric intensive care unit with a skull fracture, brain bleed, broken femur and fractured wrists. Malnourished and weighing only 11 pounds, the fragile toddler had a fresh handprint-shaped pattern of bruises on her face. For treatment, doctors hurried her into emergency surgery to drain the fluids and pressure in her brain. Hamm, who has since divorced, had been trying to conceive a biological child for four years with her husband and had undergone multiple infertility treatments to no avail, according to Mioduszewski. To carry out her plans for adoption, she approached Wolfson PICU Social Worker Jim Hutcheson, who with 19 years of experience, had often seen pediatric caregivers consider adopting abandoned and abused children but never witnessed anyone complete the process. Since there was alleged abuse, Delilah’s case had been taken up by DCF. Hutcheson also advised Hamm to call Family Support Services of Northeast Florida, so she could start the process of becoming Delilah’s foster parent, Mioduszewski said. Adoption day “we were a PB & J sandwich,” Jessica said. 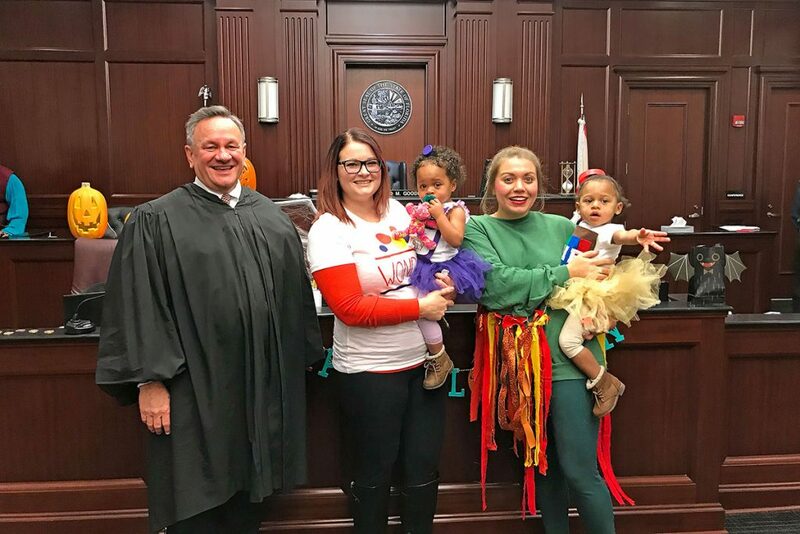 Included in the photo are Judge David Gooding of the Duval County Family/Dependency Court with Jessica Hamm, Delilah and the girls’ godmother, Gennara Fitzroy, with Caroline. It was only after DCF approved her as a foster parent, that Hamm discovered Delilah was a fraternal twin. Delilah’s sister had been brought to Wolfson’s emergency room hours after she had been admitted. Also malnourished, X-rays of the child soon revealed healing fractures, indicating the second little girl had also suffered chronic abuse. Later renamed Caroline by Hamm, the toddler had been placed on another floor, and hospital personnel had yet to make the connection between the two. When Hamm learned the situation could be a twofer, she didn’t hesitate. 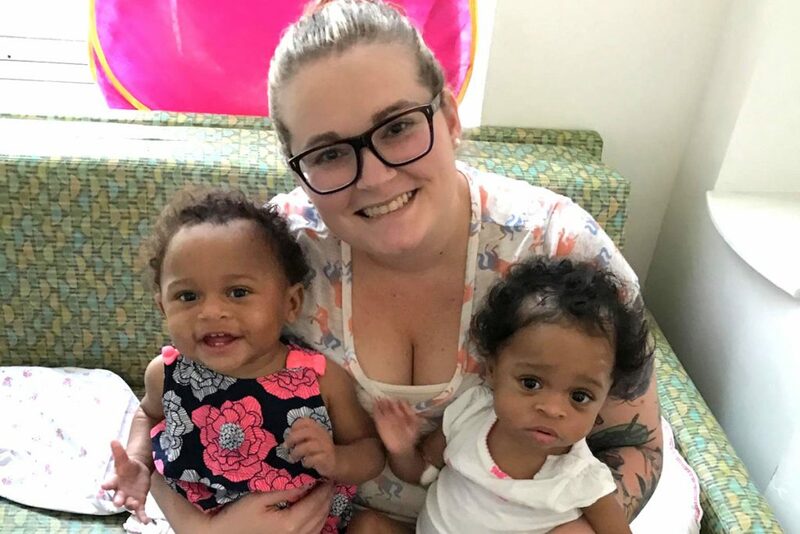 Without even meeting Caroline, she decided to take both girls home as their foster parent as soon as each was discharged. The adoption became final on Oct. 31, 2017 in Judge David Gooding’s office. 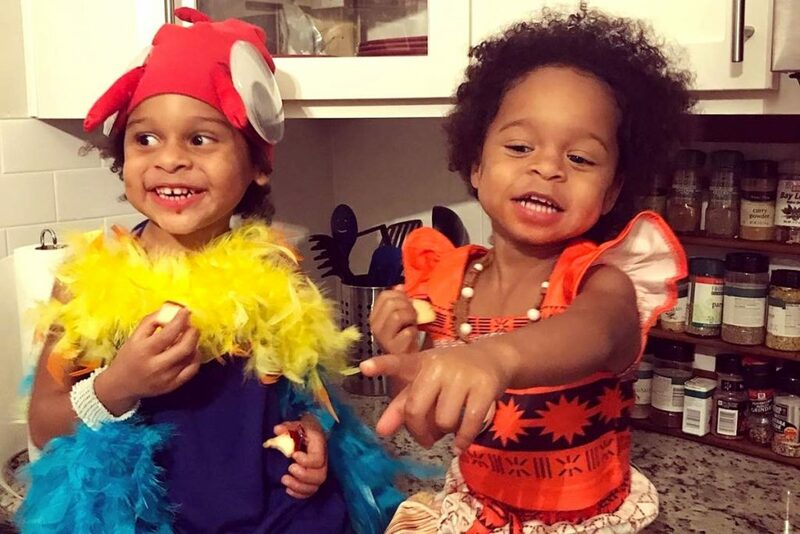 Since the ceremony took place on Halloween, Hamm dressed her new family in costume – Caroline as peanut butter and Delilah as jelly – with Hamm, naturally, clothed as the bread that would hold her new family together.